With a sharp mind and a keen knack for realism, as well as the ability to recall the most minute of details, Frances Glessner Lee should have been destined for greatness. The wealthy young heiress should have been a force to contend with, in the history of law enforcement and forensic sciences, and to some extent, she is. However, being a woman during the depression era, she was denied a formal education based on her gender. It was not until she was in her fifties that a friend, Dr. George Burgess Magrath, was elected to the position of Medical Examiner of Suffolk County, MA. One of his new duties was to report on the probable causes and circumstances surrounding unexplained deaths. During conversations with Magrath, Lee was fascinated by the details and descriptions of unsolved cases, and she came to the conclusion that there was a need for training in the field of murder investigation. The focus of the period seemed to be mainly through police science and eschewed most medical approaches. In fact, there were only a few states that required their coroners even possess a medical degree. Lee hatched a plan. She funded and set up a Department of Legal Medicine and based it out of Harvard University. She gave seminars and lectures and began a curious and helpful hobby—building dollhouses. These were no ordinary dollhouses. They were re-creations of crimes scenes, full of death and mayhem. The attention to detail, astounding. The tiny wooden cupboards were stocked with miniature food packages, the lights worked, minuscule pencils had lead tips and could be used to write with, they were fully functioning houses on a smaller scale. Then the dolls were added, and the tone of the pieces changed. 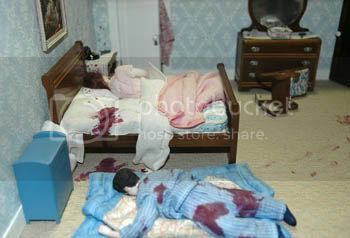 A doll-sized bed splashed with blood as the victim sprawls across it. Another lays face up in a basin tub as tap water pours into her open mouth drowning her. 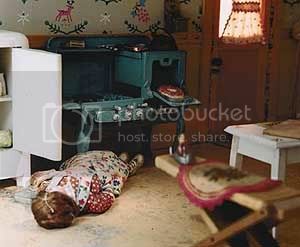 A doll lays on a kitchen floor, before a small stove with a smaller pie cooling on its top, a knife planted in her back. A doll of a man lays face down in front of a re-created liquor store. The meticulous details, all executed by the wrinkled hands of this sad genius. Lee dubbed these models, these perfect re-creations of actual crime scenes, “The Nutshell Studies of Unexplained Death,” after a popular police saying. Lee continued to work and assist the law enforcement community until she died in 1962 at the age of 83. She was in the midst of a final and very personal model. She called it “The Swedish Porch,” and it was a delicate and accurate model of a room in her own house where she liked to sit and reflect. This model had no dolly corpses or blood stains, no foul play or dark deeds, just closure. This final model went unfinished. There is a book available about this fascinating woman and her work, entitled “The Nutshell Studies of Unexplained Death,” by Corrine May Botz, and was published by The Monacelli Press. You can find that book here. 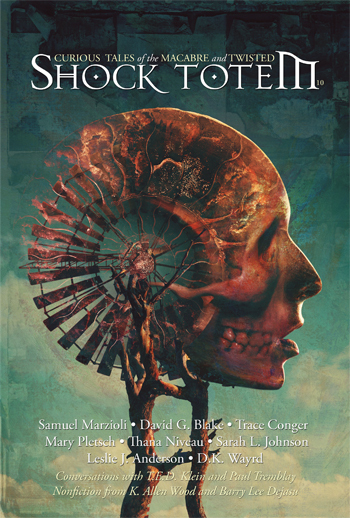 Note: This post does not reflect how things are handled at Shock Totem. Have you ever heard an editor say a story needs to grab him—or her—within the first few pages? Have you ever thought about what that means for you, as a writer? What it really means? Because some stories beg for the explosive intro, and others require a slow build. It all depends on the tale (excluding flash fiction, which has no excuse not getting right down to business). But how often is a great story overlooked because an editor—and there are plenty who subscribe to this school of thought—thinks a story needs that WHIZBANGPOW! opening? I recently finished a 5,300-word story. In standard submission format—12pt Courier font, double-spaced—it’s 29 pages long. Now let’s discuss exactly what that translates to: Changing the format to Times New Roman, single-spaced, the story shrinks from 29 pages down to 11. What was once the first three pages an editor sees is now barely a quarter of the way down page two, and the story starts halfway down page one! So we’re talking a mere 483 words. Frightening. But it’s worth thinking about. We, the writers, must impress within the first few pages, right? We’re told this over and over again. But depending on the publication that standard may be an illusion, because in standard submission format, those pages represent but a handful of words—not pages. And that’s just to keep the door from closing, let alone getting your story across the threshold! And beyond that there’s a whole new set of obstacles.